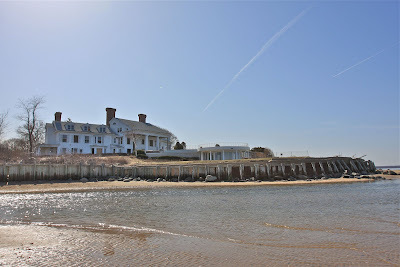 'Kidd's Rocks' / 'Lands End', the John Scott Browning estate built c. 1911 in Sands Point. This shot showing the doomed house includes the pool pavilion all the way down to the bulkhead and waterfront. Click HERE for more on 'Kidd's Rocks' / 'Lands End'. there was always something about this house that looked odd to me but i could never quite get it. the pic today shows it. its the chimneys. first, the caps are too heavy and second, the caps wouldn't be so noticeable if the chimneys were centered on the peak but the off peak location makes the house look odd. do we know how much longer? i suppose the gatekeepers house goes too and i also suppose nothing will be saved and the whole thing will be landfilled? After looking at Bing again, how are they going to fit 5 mansions on that piece of property. It doesn't look like there is enough room, let alone for three. 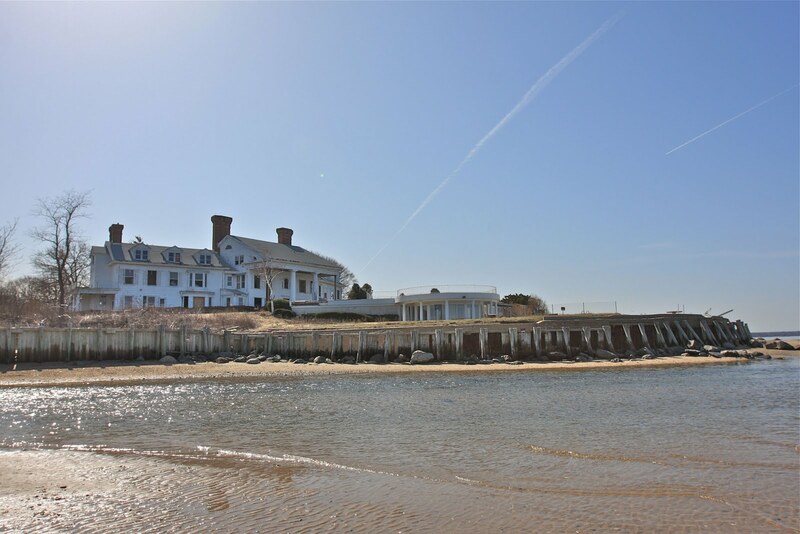 "After looking at Bing again, how are they going to fit 5 mansions on that piece of property. It doesn't look like there is enough room, let alone for three." Five would be easily doable, but I'm expecting things to escalate to the point that he applies for [and gets] 10. Revenue for the county, how can they say no. Unsure of the height restrictions on that point of land, but building UP and fanning around the curve would yield a nice little community of lavish townhomes for exclusive-accustomed, downsizing baby boomers. Maybe even keep the pool for the community association. OLI, thanks for keeping the Lands End conversation open. I'm sure Sands Point has a minimum acreage requirement. Old Westbury's is 2...it was 4 briefly for a time earlier in the decade but was brought back down to 2. Either way the Lands End property is too prime to build too many houses on. Whatever is built will sell for quite a pretty penny either way. I think the owner mentioned a price of $10 million each. I don't see townhouses on this piece of property. It is not the right area for it. That is ashame Old Westbury lowered it's standards. "I don't see townhouses on this piece of property"
Zach, do you know if the rezoning of the land Greentree stands on is resolved? I remember when I worked in an adjacent office building that before Betsey died the town tried to rezone from quarter acre to 2 acre, thereby devaluing the land by some $40 million (at the time). My understanding was that it had nothing to do with the actual devaluation and everything to do with the ungrateful town fathers not having faith it the Whitney family word not to develop Greentree. I believe Sands Point has a guideline on two acre zoning, but that it is easy to get a waiver. In the case of Lands End, since some of the land is marsh & thus unbuildable, they can include that acreage when apportioning out the building lots, kind of like selling air rights in Manhattan. Does anyone know the exact date of demolition? I would love to see this house and feel the memories. Pictures are lovely....so sad that it cannot be saved. Any hope at all?